Installing Windows with KUBAM isn&apos;t as easy as we&apos;d like it to be. Still, its better than many of the other sucky methods you&apos;ll run into out there in the wild. KUBAM makes doing it on UCS easy as possible! Create a WinPE image on existing Windows Server with UCS drivers using the KUBAM winkubam.bat script. In the KUBAM GUI: Extract the ISO and copy template. We&apos;ll go through each of these steps in detail. The technician computer can be a virtual machine or physical machine. If it is a physical machine it does not need to be running on Cisco hardware to create this image. 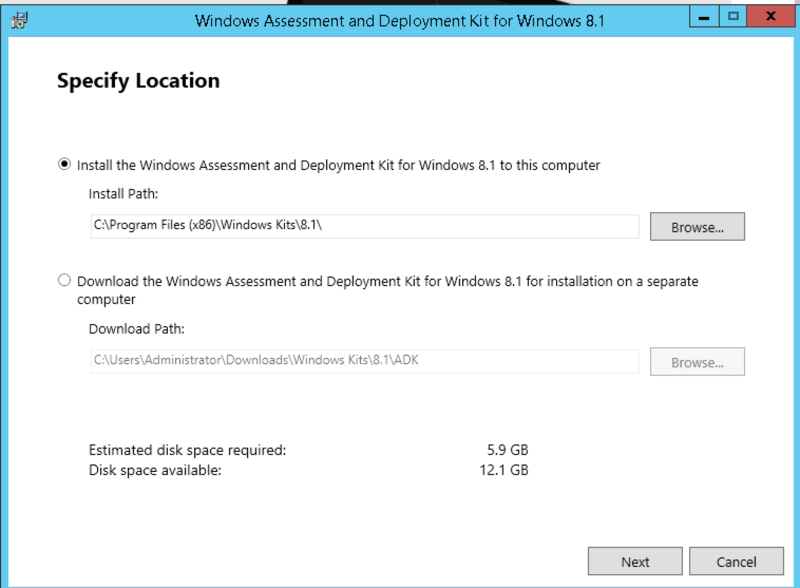 The Windows Assessment and Deployment Kit (ADK) is required to build WinPE images that KUBAM can use. Yes, we know this version is old, but it works so we use it. We&apos;ll update it when the need arises. Install using the default directory. While this installs about 3 GB, have a look at this bee keeping website, run by Daniel one of our developers. If you happen to be in Croatia you can order some honey. The latest Cisco device drivers can be downloaded from Cisco&apos;s Support site. URLs seem to change from time to time, but was last available here. If that link is dead, go to https://cisco.com/support and in the Downloads menu type UCS B-Series Blade Server Software the main Cisco Site, then download the drivers. It seems to be a 1GB file. 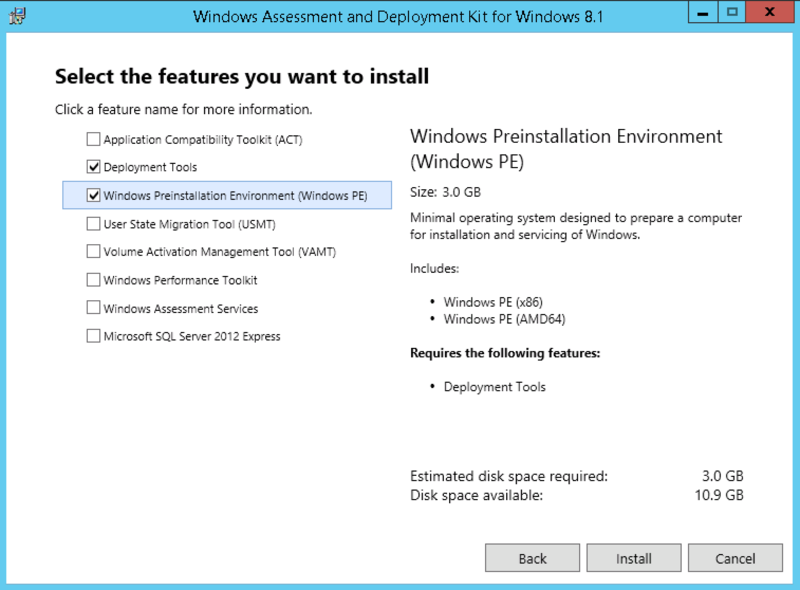 NOTE: Even if you are planning on deploying Server 2016 you should use the Server 2012 R2 drivers for the WinPE image. You&apos;ll need the other drivers for 2016 for the second part of the installation so just hold on to those! winkubam.bat - This is the script that will create the WinPE image adding the drivers and the new startnet.cmd file. startnet.cmd - This file is placed in the WinPE file and is the customized startup file we use for installing using the vMedia + the KUBAM CIFS servers. Mounts the KUBAM CIFS Share that has the installation media. Runs setup.exe with the autoattend.xml file found in the c:\ drive placed there by KUBAM. At the end of this process you&apos;ll have a c:\WinPE_KUBAM.iso file which is the WinPE. scp or use some other radical means of getting the c:\WinPE_KUBAM.iso file to the KUBAM server. Please keep the name of this file the same as KUBAM looks for its presence. Now copy the drivers to the appropriate ~/kubam/windows/drivers directory. This is a pain, but notice there are two images that get the UCS drivers: The WinPE image for booting and then the actual image it installs. Copying the drivers to the KUBAM server is for the installed image to have them. On the KUBAM server, use the API or GUI to extract the Windows ISO image to the KUBAM server. It will place it in either the win2012r2 directory or win2016 directory. If you have (recommended) your own autoinstall.xml file put it in the ~/kubam/ directory and name it either win2016.tmpl or win2012r2.tmpl depending on which Operating System you are using. We recommend you base it off our sample templates so you get the driver installation and RDP. With all the files in place the automated deployment is ready to go. You can now create the individual image files using the KUBAM GUI or API. The names of these image files will be the name of the UCS Service Profile. Now deploying the servers either through the API or the GUI will create Service Profiles, templates and a vMedia policy that will map to the appropriate OS files. The Server should now install. autounattend.xml file. This is the template for this image to install. network.txt file. This file contains the network settings of our node and is used for starting up the server and mounting the CIFS share. Why do we do this? Well, we want each node to be unique. We could cram all this into the WinPE image but then we&apos;d have a different WinPE image for every node, which means a lot of storage. By breaking it out, we use the least amount of storage as possible with the most flexibility. Check out our samples for what this could look like. Note that these are templates and appropriate values should be stored in there. The file should be called autoinstall.xml when installed. You should create your own to match the stuff you need. This can get tedious for a bunch of nodes. This is why we use KUBAM to automate this part!